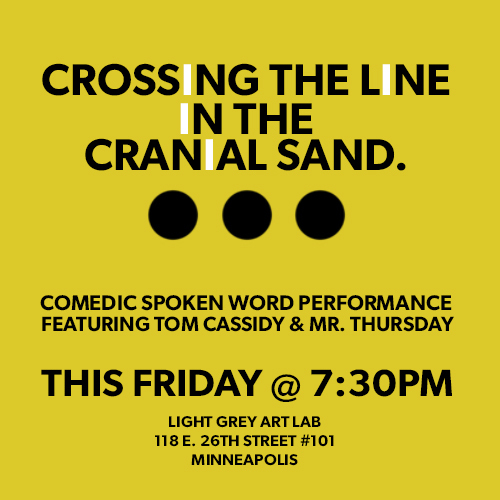 LIGHT GREY ART LAB: Crossing the Line in the Cranial Sand : Comedic Spoken Word with Tom Cassidy & Mr. Thursday. Crossing the Line in the Cranial Sand : Comedic Spoken Word with Tom Cassidy & Mr. Thursday. Join us this Friday, July 26, 7:30 p.m. for a lively, comedic spoken word event: Crossing the Line in the Cranial Sand – Words that Bully, Amuse & Interconsonate. We had a great visit several months ago from Tom Cassidy, coded language expert and slam poetry artist and multi-faceted genius. If you had the chance to stop by that night you would have been privy to all sorts of amusement! Here's a quick link to our podcast of the event if you haven't had a chance to hear it! So, when Tom sent us a note about an upcoming evening of excitement and insanity, we jumped at the chance! Spoken word artists Tom Cassidy and Mr. Thursday (from Roanoke, VA) perform nontraditional and stand-up poetries about art, Neptune, and flaming poodles. Mr. Thursday, a teacher and a coordinator of Roanoke’s Annual Marginal Arts Festival, and Cassidy, who mounted several Dada Spectaculars in Oregon, will also discuss and field questions about pre-flash-mob public art events, found art, and art left to be found. Mr. Thursday hails from Roanoke, VA. His lectures are derived from different texts and actions, which combine Fluxus, Situationist, and Post-Neo Absurdist techniques. In them he uses props, texts, found material and costume to code a dialogue performed through improv, paroxysms, and loud vocalization. Masculinity, warfare, popular and underground erotica, role-playing, desire and the intersection of these concerns in the exterior world are some of the recently highlighted concerns of these performance lectures. Tom Cassidy is a spoken word and correspondence artist whose work makes the mundane seem far more important and funnier than it really is. He has been an active participant in the international mail-art community since the early 1970s and his works have appeared wherever the envelopes were opened. A former board member and series host (Access to Art) for the Minneapolis Television Network, he currently serves on the boards of both Cheap Theatre and Patrick’s Cabaret and regularly performs hither and yon. If you're in town and you are looking for a night full of incredible madness, join us! Here is the official facebook invite.